with Torrent holding Chople Berry used blizzard ??? Chople Berry makes focus blast not vary effective because water is not week to fighting ??? Azul chople berry only works for SE so ya skip. Reniclus @ Dark lowering berry (forgot the name) @ Overcoat used Ice Beam! Scizor with Choice Band and Technician used Bug Bite. Yeah, meh and boring, but w/e. Houndoom @ Flash Fire @ Passho Berry (that lowers water i think) used Dark Pulse! Arceus-Fighting @ Multitype @ Fighting Plate used Judgement!!! also since the 6x Fail law is no long in effect you can still post but please use your brain. Azul FAIL x1 but I think you've figured out berries now, right? Guess what Its DOUBLE BATTLE TIME! Moltres with Flamebody (no contact, okay?) @ wacan berry used Air Cutter! 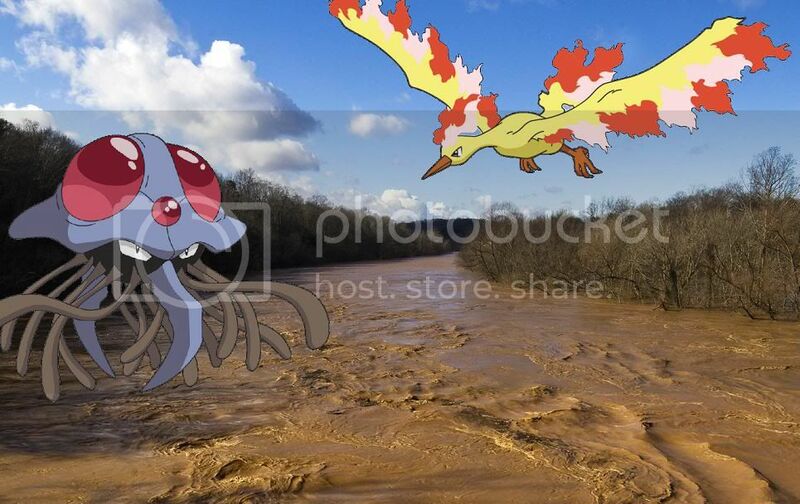 Tentacruel with Liquid ooze @ air balloon used Muddy Water! Yay now we have pernament Hail weather. By the way, welcome back /vXv\! Heatran w/ Flash fire @ Air balloon used Earthquake! Heatran w/ Flash Fire @ Passho berry used Rock slide! @ Poison Heal @ Payapa Berry used Mach Punch! @ Levitate @ Occa Berry used Rock Smash! with Snow Cloak @ Brightpowder used Double Team! with Snow Cloak @ Brightpowder used Hail! Also, I failed 4 times cause of a misunderstanding Jsxtm cleared up? Wut? @ Cute Charm @ Chople Berry used Focus Blast! @ Rain Dish @ King's Rock used Air Slash! Thunderus with defiant @ Yache berry used Discharge! 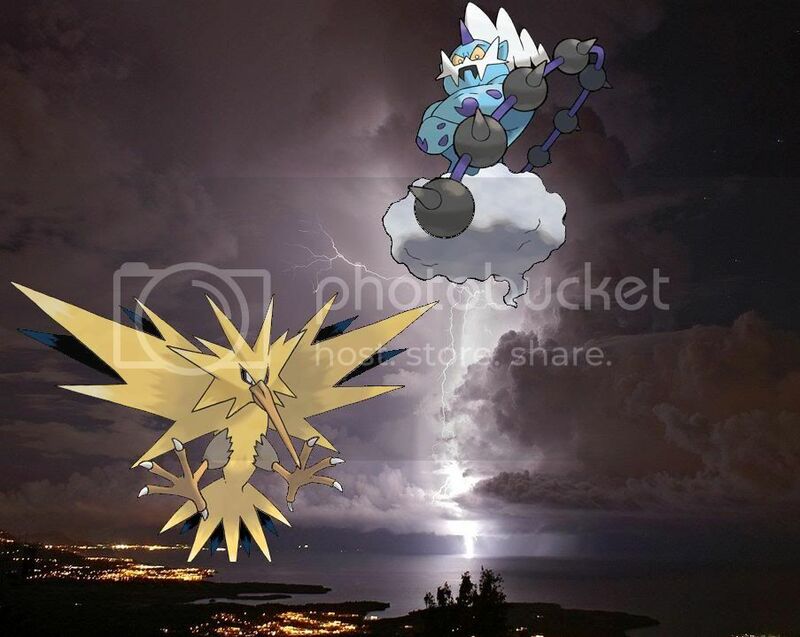 Zapdos with lighting rod @ Charti berry used Roar! @ Sheer Force @ Power Herb used Solarbeam! @ Soundproof @ Chople Berry used Heavy Slam! Man, I hope this one's right. I forgot about Incinerate hitting both Pokemon. Last edited by Aquadude on Fri Aug 26, 2011 8:07 pm, edited 2 times in total. Aquadude, Blizzard isn't super-effective against either of the Pokemon I used. Try again. I was going to post almost the exact same thing, but then I remembered that Charizard takes regular damage from Blizzard. Man this is a tough one. I've been working on it for 5 days straight and haven't come up with a solution.